Twenty-First Century Bonfire is an aleatoric light sculpture intended for collective viewing in quiet, low-light, intimate spaces. 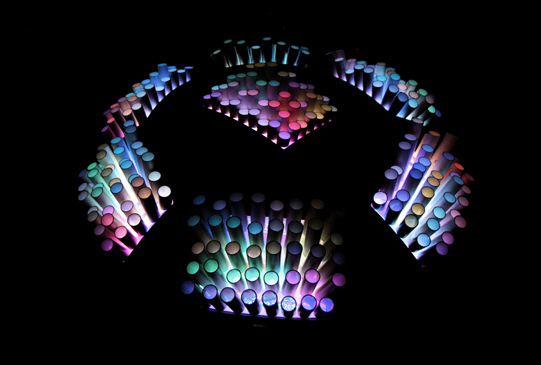 The Bonfire consists of seven rescued television sets topped by protruding matrices of PVC pipe that diffuse live television broadcasts into a shifting array of rich colors and abstract shapes. These heavily-researched and targeted messages of consumption—all provided free of charge by unwitting corporate collaborators—are filtered into abstraction simply by scattering them inside the PVC piping, rendering the process entirely transparent to the curious observer. The work is intended to be experienced, like an actual bonfire, at the center of a gathering of viewers. Situated accordingly, the installation becomes a space to be quiet, to meditate, to think, and to sit with others without the constant pressure to sustain conversation. When there is nothing to be said, the Bonfire is a returning point, encouraging collective silence and shared meaningful moments of introspection. Ultimately, Twenty-First Century Bonfire is an attempt to rescue one of our most deeply ingrained instincts—the need to sit with others around a glowing source of light—from the homogenizing three-act structure and the corporate consumption agenda.